When I’m not tapping out articles in front of a computer, I’m usually in a kitchen, whipping up something to eat. Usually that means old reliables, but I like to mix it up now and then by trying a new recipe. But usually there’s something standing between me and expanding my culinary horizons: the ingredient list. More recipes than I care to name have what I’ve grown to call “The Deal Killer”—a single, necessary ingredient that I don’t have and can’t procure without undertaking a Joseph Campbell-style hero’s journey. The makers of Appetites, an iOS app offering step-by-step cooking instructions, must run into that problem a lot. Because the next update to Appetites will introduce a feature that should appeal to home cooks who always wanted to try that marinated seared tuna but don't happen to have the sambal olek the recipe requires: ingredient delivery. 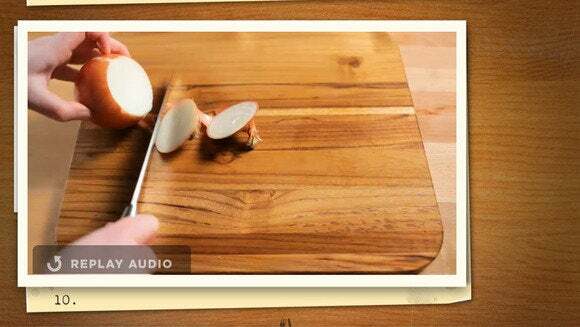 Appetites includes step-by-step instructions for its recipes, highlighted by helpful videos. The ingredient-on-demand feature is part of an upcoming update to Appetites, which the app’s makers were showing off at last week’s Macworld/iWorld show in San Francisco. Appetites is updating its app for iOS 7. 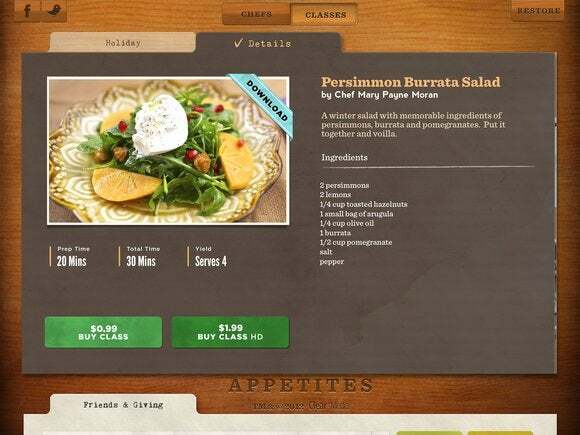 Each week, Appetites will offer users four to six new classes available for download, along with a preview video aimed at helping users decide whether to purchase the class. Appetites is keeping its step-by-step approach in which the app walks you through each step of preparing a dish with a helpful video. A sign at the Appetites booth at Macworld/iWorld last week touts the ingredient-delivery service. It’s the addition of home delivery that’s likely to draw the most attention to this upcoming release. A lot of cooking apps will compile a shopping list of the ingredients you need to make a particular dish. Appetites hopes to go one better: If you’ve gone through a recipe in the app that you’d like to prepare yourself, you’ll have the option of ordering all of the ingredients; they’ll be delivered to you the next day. We’ll have to wait until the service launches to see the pricing on this home delivery feature and whether it’s substantially more than you'd pay if you went down to the supermarket and gathered the ingredients yourself. Then again, for some cooks, off-loading the hassle of shopping may be worth a premium. For now, ingredient delivery will be limited to Los Angeles and San Francisco. Appetites hopes to expand to other West Coast cities in the third quarter of 2014, with some East Coast cities coming online by year’s end. We’ll look forward to testing Appetites’s new offering when it’s available, especially if it makes it easier to get that sambal olek—after all, this ahi isn’t going to marinate itself.